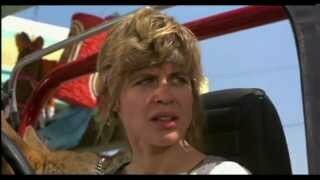 I should mention before I begin this page in earnest, that it is obviously not a scientific assessment of Sarah Connor’s capabilities. Her abilities are that of the average human being, or rather, the average human being when pushed to breaking point. This page serves more as a character profile. When we are first introduced to Sarah, she is a waitress in her early twenties, living with a friend, and she has a pet iguana! She is just an ordinary girl, trying to get through life, until her world is shattered with the arrival of Kyle Reese and the Terminator. 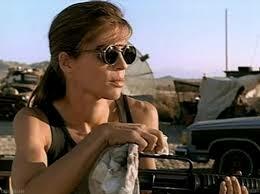 First of all, she learns that someone is going around killing other people called Sarah Connor. This, naturally, fills her with fear. She gets in touch with the police and hides in a nightclub, actually trying to hide from Kyle (who she suspects is following her – which he is) It’s in this club that she encounters the Terminator, and she is saved when Kyle intervenes via shotgun. In the space of the next few hours, Sarah learns her unborn son will become the hero who saves humanity in the war against the machines, and that there is to be a huge nuclear war that destroys most of civilisation. She discovers that the machine chasing her is damn-near indestructible, and she witnesses first-hand how ruthless it is. So, she is catapulted from her normal, quiet life – into a terrifying pursuit, and learns she is the mother of humanity’s saviour. No pressure then! Her and Kyle swiftly grow close – circumstances pushing them together – and Kyle ends up becoming John’s father. It is only a few hours later though, that Kyle dies whilst protecting her, and Sarah has to face the future alone. After John is born, Sarah takes him from place to place (including central America) to learn from military and rebel leaders so he’ll become a ‘great military leader’ at some stage. However, she is not content to simply teach John how to be a leader and how to fight – she decides to try and stop Skynet from ever being created, thus altering the future. To this end, she tries to blow up a computer factory, but instead winds up getting arrested and institutionalised. After all, the story she tells – that she knows for a fact there will be a war, and that machines can travel back through time, is pretty crazy. Estranged from her son and trapped within a correctional facility, Sarah becomes hard, intense, and bitter. She frequently clashes with the doctors and guards and makes a number of escape attempts. Understandably, no one believes she is telling the truth – even John no longer believes her. The burden of knowing with such certainty that there is going to be a nuclear holocaust, coupled with no one, not even her own son, believing her, is, naturally, traumatising. Sarah appears to become more and more withdrawn, probably not sure of what to do – until the police visit her, showing her pictures of a man she encountered once before -the Terminator is back, and Sarah is certain it’s back for her son. She plans another escape attempt – an attempt which might have succeeded – but she is interrupted when the Terminator of all things shows up. Only this time, it’s come to rescue her, and it is protecting John. The T-1000 shows up and chases them all, but they manage to get away from it, and Sarah, despite seeing her son for the first time in who knows how long, admonishes him, telling him he shouldn’t risk himself, even for her. Now free, and now that she can learn what she needs to know about Skynet’s creation from the Terminator, Sarah sets about finding out who is mostly responsible for developing Skynet – a man called Miles Dyson. Going off on her own, Sarah plans to kill Dyson. However, when face-to-face with him, surrounded by his family, and pleading for wife and son to be spared, Sarah realises that Dyson doesn’t know what he’s supposed to be responsible for. She breaks down in tears, and is confronted by John (who has gone after her), and she realises that John has gone after her because he loves her, and wants to help her. The two reconcile, and Sarah adopts a new plan – working with Dyson, they arrange to destroy the Cyberdyne lab where research into Skynet is taking place. They succeed, though Dyson is killed during the attack, and Sarah is wounded by the T-1000 in their escape. She ultimately stands side-by-side with John as they face off against the T-1000 one final time, and shakes the hand of the Terminator who helped protect her son – something unimaginable at the start of the film. Sarah’s journey is a hard one. Her life gets turned upside down, more than once, and she has the burden of knowing the world will get shattered, and also the burden of being unable to do anything about it. She has to cope with her own flesh and blood not believing her, and with all of that, it’s no wonder people thought she was mad. In the end though, she demonstrates how tough she is, enduring a lot of emotional, mental and physical pain, to ultimately patch things up with her son, and put the demons of her past to rest.